Assassin’s Creed | Geometry saves the Earth! 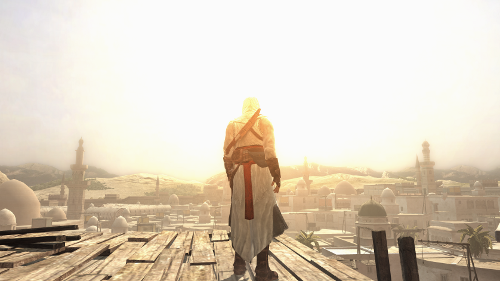 What separated this game from its competitors in 2007 and still does to until today is the movement system by which the player controls the main character, Altaïr. The system makes it extremely easy and intuitive to walk and climb anywhere. There are occasional hiccups especially in the midst of a chase, but nothing major in my eyes. The game reminds me of two others. One part of the mechanic definitely has an ancestor in Metal Gear Solid, which I’m currently getting into. The whole concept of staying below the radar of guards and hiding in hidings spots until they stop searching feels similar to MGS. The other game is this year’s Infamous, which sports the same “vertical” (climbing and jumping) gameplay and free movement. Assassin’s Creed is definitely the better game compared to InFamous for me. The whole scenario and the implementation of such things as the movement or combat system feels much better in Assassin’s Creed then in Infamous. The side-quests are one of the major points that were critisized about Assassin’s Creed when it first came out. I have to say I didn’t mind it that much, even though the quests repeat heavily, once I got into the flow of moving efficiently in the cities and fighting quickly, I enjoyed them. The only major nuisance in my feeling are the “Informer” quests where one has to kill certain designated targets in a limited time. Somehow, I would always get all but the last target done, and then always mess it up and have to start over.